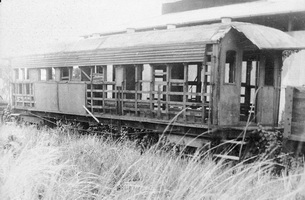 Composite class narrow gauge sitting cars with longitudinal seating. 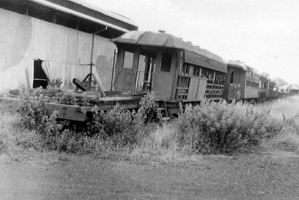 Some were built by the South Australian Railways and purchased by the Commonwealth as part of the takeover of the North Australia Railway. 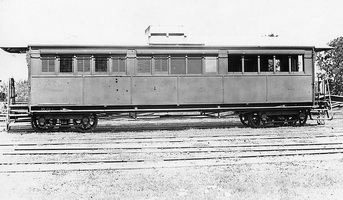 Built at the South Australian Railways Adelaide locomotive workshops 4.1888, and issued to the Palmerston division as composite car "No.94", seating 14 first and 25 second class passengers. Taken over by the CR and coded "NABP 2". 4.1888 Entered service on the South Australian Railways Palmerston division as car "94". 1907 Fitted with toilets, ladies compartment, electric light and through walkways on end platforms. 23.4.1934 Destroyed by fire at the Darwin sorting sheds. - Underframe used for "NABP 7". Built at the South Australian Railways Adelaide locomotive workshops 4.1888, and issued to the Palmerston division as composite car "No.95", seating 14 first and 25 second class passengers. Taken over by the CR and coded "NABP 3". 4.1888 Entered service on the South Australian Railways Palmerston division as car "95". - Converted to all second class and recoded "NBP".